The life of an app marketer isn’t an easy one. To maintain a favorable position in the app store and in the minds of the users, one has to dabble with numerous campaigns. These campaigns are usually aimed at user acquisition, user engagement and lead generation- a tight spot to be in! Many amongst the tribe have chosen to dabble with In-app referrals and have even tasted unprecedented growth.Even though app referral program by brands like Airbnb has become a benchmark for developers-there’s more than meets the eye. A clear strategy that encompasses the do’s and dont’s of an app referral program is one of the many factors to begin with. Setting up limits for an app referral program can benefit app marketers in numerous ways. In this article, I will be discussing why it is significant to have clarity on what’s permissible and what’s not while running app referrals. In the second half of the article, I shall run you through a few pointers that will help you in gaining the most from your app referral campaigns. Most app marketers tend to launch an app referral program once they have tested enough waters. While app referral program tends to be an excellent user acquisition strategy, very often app marketers tend to introduce it when their other marketing channels have lost steam. In case of mid- enterprise level apps, having a clear do’s and don’t list brings the whole team on a single page, while taking decisions. In-app referral is one marketing tactic that touches all the elements of the AARRR framework. It can acquire users and activate the inactive ones. Furthermore, In-app referrals help in retention and revenue generation, apart from acting as a facilitator for referrals. With a basic do’s and don’t understanding, app marketers can leverage the framework in the best possible way. Having understood the significance of maintaining a do’s and don’t checklist for app referrals, let’s work our way through and list them one by one. No marketing tactic is full-proof and as marketers we’ve all been exposed to both- oops and aha moments! While it is delightful to savor the aha moments, it can get rather tricky in case a marketing campaign does not move the way it was expected. A quick do’s and don’t checklist can help app marketers, who are just beginning to savor the fruits of referral marketing and add to the list as they grow! What have we missed here? Do let us know in the comments below. Every business owners seek to have more customers and people can get benefited via their mobile app. In this regards, referral programs help to get more visitors and of course more purchases. 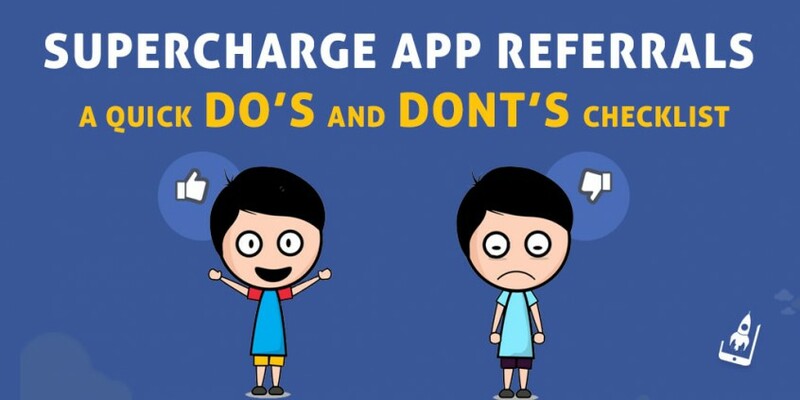 For successful app referral, we should consider these do’s and don’t’s.